Complete comfort and control can help turn a house into a home. Captivate your clients by adding MyAir to your next proposal. Want your offer to have a competitive edge? Why not include MyAir to your home building projects? By adding MyAir you are also adding value for your client that could be the difference between them choosing you or someone else. Start a conversation with Advantage Air about adding MyAir to your home building projects today. New homeowners love the look of MyAir, so improve the chances of them falling in love with your home by adding it to your next build. MyAir runs on the centrally located MyPlace touch screen, and because it is compatible with all major brands of air-conditioning units the need for multiple controllers on the wall is eliminated. MyPlace can easily be added to further enhance the connected home. It makes smart home technology simple by working with existing products in the home such as lights, fans, some motorised blinds, garage doors and more. It all runs from the same touch screen and app. Then for even further value, optional Individual Temperature Control (ITC) sensors improve your client’s comfort and energy savings. At Advantage Air, we pride ourselves on providing our customers with excellent service from start to finish. We are committed to quality and make the majority of our components right here in Australia, so you can take comfort from the fact your MyAir system is built to last. But it doesn’t stop here. We have worked hard to structure our service department to be a helpful resource for your client. MyAir can be easily installed into most new home builds. 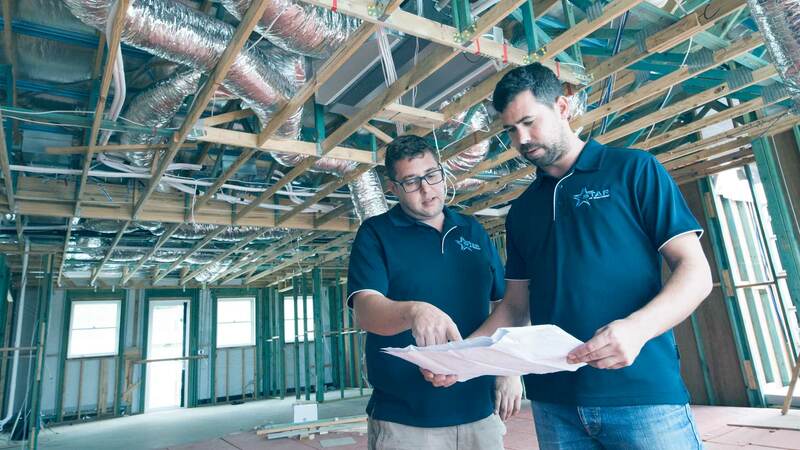 Our ingenious engineers have designed and manufactured an innovative ducted air-conditioning system that will seamlessly integrate into your building project. Made to “plug and play”, this intuitive smart system will have no implications on your building time, meaning your client can enjoy their new home with comfort and control sooner. Being local, we offer excellent after-sales support and service, including a helpline staffed by our experts right here in Australia. We want to ensure all your clients’ enquiries after the installation of their MyAir system are answered quickly and efficiently, so our dedicated Technical Support team are always happy to help. The guys are amazing. Brilliantly designed products, and brilliant and personalised service. Very impressive. The service team from Advantage air were first rate. Understood what the issue was, troubleshooted it quickly and fixed it. Something the original installation company had failed to do. We now have a system that performs to our expectations. I’ve made a couple of support calls to solve some issues relating to software updates and they have been really great. Advantage Air have responded very quickly to email queries, actually answer the phone if rung, and fixed all issues over the phone. They are very professional! So great to see an Australian company with a world class product and 5 star support. I have had the MyPlace app for over a year now and it has been flawless. Love the fact that I can turn on the Aircon before I get home and the upcoming integration with Google Home/Assistant will be the icing on the cake. Have only had to contact support once and they were extremely helpful. Highly recommended. Finally found the perfect air conditioning control system for my home. I have tried two other systems and could never get the temperature control in my 5 bedroom home. Amazing product….extremely easy to use and fantastic features. Suites all of my needs!! So happy with our new ducted system installed a few weeks ago. The MyPlace app is so easy to use and so convenient to control temperatures/zones from my phone without having to get up or even be at home! This is the best AC component company I’ve found. I work in the industry and I’ve purchased and used many of their systems. Their products are cutting edge and the company has a friendly “family” feel to it.